Microtargeting beer: You are not what you drink. 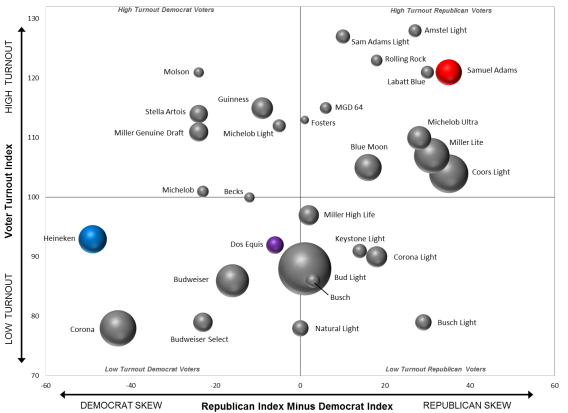 Yesterday’s most trafficked piece of political data candy was the above chart of beer brands arrayed according to the political orientation of their drinkers, which ran on National Journal’s website. Former George W. Bush ad strategists Will Feltus and Mike Shannon have become specialists in these displays, which are all based on voluminous studies that Scarborough Research conducts primarily to help advertisers distinguish the consumer habits of viewers of different television shows. As 2004 approached, Feltus recognized that the Scarborough survey included two questions usually overlooked by commercial marketers, asking respondents about their partisanship and frequency of voting. It quickly became possible to plot TV audiences along those two axes, which Feltus used as a guide to which shows would be the best fit for reaching the Bush campaign’s targets. But the Scarborough surveys offered an unending trove of future insights: one could similarly map any other consumer preference that the firm asks its 200,000 respondents onto political orientation. Indeed, Feltus and Shannon reach a conclusion that suggests there’s little value in any of these correlations for the political world. We continue to advise big brands—who spend millions on consumer research—to make the investment to know where their fans stand politically and to put in safeguards to mitigate a political firestorm. The implication is clear, and long overdue: political targeters shouldn’t waste time trying to translate insights from the beer aisle to the voting booth.